The shoes show minimal wear. The shoes show no wear. New, unworn condition. We offer fast shipping and friendly service. 2nd item ships free. Please check our other auctions! 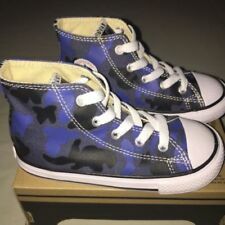 Converse CT HI POOL SIDE POWDER BLUE WHITE Toddler Size 9 C "REAL CUTE PAIR"
I HAVE A NICE PAIR OF PRE OWNED SHOES - ECU - Converse All Star CT HI POOL SIDE POWDER BLUE - WHITE - BLACK TRIM Toddler Size 9 C "REAL CUTE PAIR" "REAL CUTE PAIR OF SHOES. I AM SORRY I DO NOT HAVE THE ORIGINAL BOX. Toddler pair of Converse All Star shoes in a size 9c. These are adorable! Light/normal signs of wear. Beautiful red color. Boy or Girl. In good condition. Wording on back of heels is removed. See pics for your approval. The shoes show minimal wear. We offer fast shipping and friendly service. 2nd item ships free. Please check our other auctions! 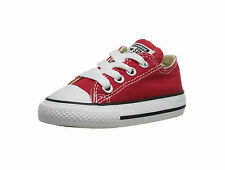 Converse All Star Low Top Toddler Red Slip On Size 9 Sneakers. Condition is Pre-owned. Please see photos for details! Shipped with USPS Priority Mail. CONVERSE Light Blue ALL STAR TODDLER SHOES SIZE 9 So Comfortable FREE SHIPPING. Condition is Pre-owned. Shipped with USPS First Class Package. 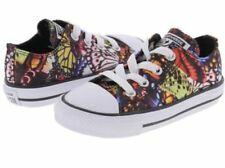 A very nice pair of toddler kids Converse All Star shoes in a size 9c. Navy Blue/Burgundy with a quilted pattern. NO BOX Girl or Boy. 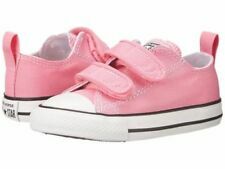 Converse Girls Toddler Size 9. Condition is Pre-owned. Aqua color with pink accents and super cute starfish design! Perfect for your beach lover! Yellow glue can be seen, see pictures for details. Shipped with USPS Priority Mail. In GREAT condition. NO scratches or creases! The tongues cuff down, and the laces have hearts on them! Toddler Converse Black Chuck Taylor All Star Shoes. Size 9. REALLY CUTE!!! 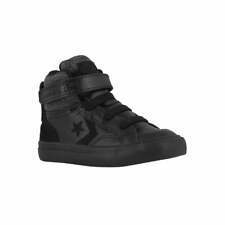 Toddler Converse Black. Chuck Taylor All Star Sneakers. Size 4 Toddler. 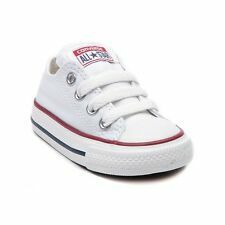 Toddler size 9 red & white Converse All Star lace up sneakers. In good condition with light wear. 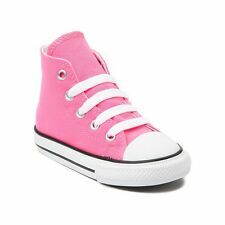 NIB Toddler Girls Converse All Star Pink Rose Flowers Sneakers Shoes Hard to find sneakers!! Size 9 (Converse run 1 Size big) Colors: Pink and white (prism pink/carmine rose) Velcro with strap Easy on/off Please know your size before buying. All sales are FINAL! I ship the same day as long as payment is received by 2pm. Thanks for looking!! Preowned pair of Converse All stars in Black on sole is slightly problematic as you can see in the images and the auction does not have laces. See all images before bidding no returns. 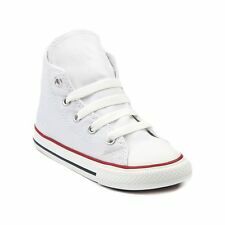 Toddler Size 9 Converse Chuck Taylor All Star Low Oxford Faux Leather Sneakers in Black and White. Great Faux Leather Material that's Easy to Wipe Off when they get Dirty. Perfect Neutral Color for a Toddler Girl or a Toddler Boy. (Good used condition. Missing one insole. Made great Doc Mcstuffins shoes for our little one :). Girl toddler purple Converse slip on shoes. No structural damage. Laces have glitter. Almost like new toddler baby Converse ALL Star Chuck Taylor OX sneakers size 9 US. Padded TONGUE. Canvas upper, rubber sole. Buffalo Plaid Lining. Black High Top Sneakers. Toddler Boy'sConverse Shoes. Classic Lace Up Style. I noted light discoloration to white outsole .